Google has a range of great products for businesses to use. As the company is behind by far the most popular search engine of them all it is quite clear that businesses need to take advantage of Google products. 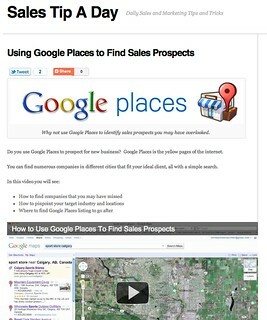 Google Places is one such product that you’d be fool to not use as part of your online marketing strategy. Here are five things your business is missing out by not using it. The one main thing your business is going to miss out on without Google Places is a good search engine ranking. If you have a profile on Google Places you are going to have a better chance of having a higher ranking with the various different search engines. Google especially gives a boost to companies that have a profile with the service. If you search for any kind of business with Google you’ll notice that all the first page results will have a Google Places profile set up. Google Places also offers the option of having your customers rate and review your business. Customers are really conscious these days and having good reviews on the internet can really help you make more new customers. It is really important that you know how to get your business more reviews. Make sure that you encourage existing customers to do it and always give good customer service so that people will have a positive image about your business. Google Places will also give you a lot of power in determining and defining your business. As Google uses the information you give on Google Places to draw information for Knowledge Graph you can really have a say on what the world knows about your business. So use this power wisely and learn to make the most out of your Google Places profile. This will ensure that your business has a strong online presence and that customers find the right kind of information about your business. The one thing you need to know about online marketing and searching today is that it is all going local. People conduct more and more local searches, especially when they search with a mobile phone. When you are out and about it is really simple these days to search for a local cafeteria for instance and businesses need to understand the importance of this behaviour. With Google Places marketing localisation is at the forefront. You’ll be able to take advantage of localisation much better and will be rewarded with more potential customers checking out your business. Therefore by having a well-optimised Google Places profile you are going to benefit from connecting with more customers. And because you are being viewed by customers that will require your services you will have much higher conversion rates to actual sales. Signing up with Google Places isn’t difficult at all. Google’s Support page provides plenty of good tips for getting started. You can also find many good guides on the internet for optimising your profile with SEO. Emma Hood is interested in online marketing and the different platforms businesses should use for marketing purposes. She is also really enthusiastic about quality wines and would love to work in a vineyard for one summer.